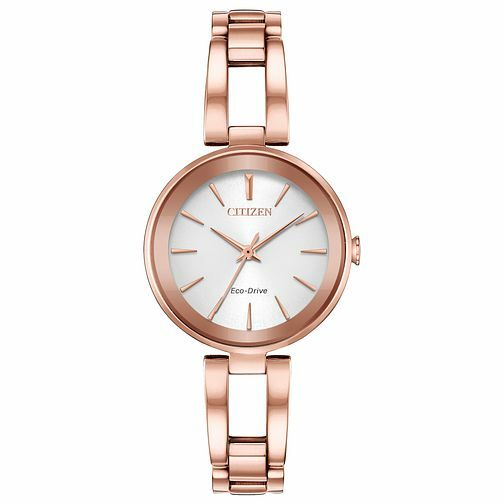 Accomplish a new elegance with this gorgeously sophisticated pink gold tone ladies' Eco-Drive watch from Citizen. With its slim link bracelet perfectly complimented by the pink gold bezel and dial accents, this timepiece is sure to become your new favourite accessory, suited to all outfits and all occasions. Citizen Eco-Drive Ladies' Pink Gold Tone Dress Watch is rated 2.5 out of 5 by 2. Rated 4 out of 5 by Anonymous from good gift bought as a gift - she likes it a lot. of course, time will tell how good it really is...first week is excellent though! Rated 1 out of 5 by Anonymous from A Glorified Second-Hand Store The watch arrived scratched, marked, and dirty. It has smudges and fingerprints all over the clock face and the back. The straps where streaked with a dirty grey substance - clearly taken off display or returned by another customer. They didn't even attempt to clean or disguise the markings. The lack of care is appalling.